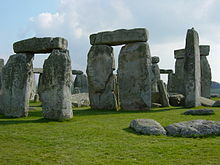 Archaeology shows that people came to southern England long before the rest of the British Isles, probably because of the friendly climate between and during the ice ages of long ago. Julius Caesar invaded what is now England in 55 and 54 BC, as part of the Gallic Wars, and was defeated. He wrote in De Bello Gallico that there were many tribes there, very similar to other Celtic tribes in Europe. Coins, and later Roman historians, have given us the names of some of the rulers of the tribes, and what they did. In 43 AD, Claudius successfully invaded England with 40,000 soldiers landing at Gaul at Richborough, Kent. For hundreds of years, what is now England was a Roman province, Britannia. The Romans later gave up on the province and left the Celtic people on their own as the Roman Empire began to fall apart. The influence of the Romans meant that the territory of England had already experienced unity before the Anglo-Saxons arrived. Analysis of human bodies found at an ancient cemetery near Abingdon, England, shows that Saxon immigrants and native Britons lived side-by-side. The Romano-British population (the Britons) was assimilated. The settlement (or invasion) of England is called the Saxon Conquest, or the Anglo-Saxon or English Conquest. From the 4th century AD, many Britons left to cross the English Channel from Wales, Cornwall and southern Britain, and started to settle the western part of Gaul (Armorica), where they started a new nation: Brittany. The Britons gave their new country its name and the Breton language, Brezhoneg, a sister language to Welsh and Cornish. The name "Brittany" (from "Little Britain") arose at this time to tell the new Britain apart from "Great Britain". Brezhoneg is still spoken in Brittany today. After a time of raids, the Vikings also began to settle in England and to trade, eventually controlling an area called the Danelaw from the late 9th century. One Viking settlement was at York, called Jorvik by the Vikings. Viking rule left traces in the English language — because Old English was already related to Old Norse, many Norse words began to be used in English at this time. The defeat of King Harold Godwinson at the Battle of Hastings in 1066 against Duke William II of Normandy, later called William I of England, and the following Norman conquest of England caused important changes in the history of Britain. William ordered the Domesday Book to be written. This was a survey of the entire population, and their lands and property, to help in collecting taxes. William also ruled Normandy, then a powerful duchy in France. 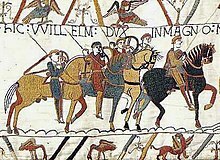 William and his nobles spoke, and held court, in Anglo-Norman, in Normandy as well as in England. The use of the Anglo-Norman language by the aristocracy was kept up for centuries, and had a great influence on the development of Old English into Middle English. In England, the Middle Ages was a time of war, civil war, rebellions from time to time, and many plots among the nobles and royalty. England had more than enough cereals, dairy products, beef and mutton. The nation's international economy was based on the wool trade, where wool from northern England was sold to the textile merchants of Flanders to make into cloth. Medieval foreign policy was also shaped by relations with the Flemish cloth business. An English cloth business was developed in the fifteenth century, allowing the English also to become wealthier. In the reign of Henry II, the king got some power back from the barony and the Church. Henry's successor, Richard I "the Lion Heart", took part in the Third Crusade, and defended his French territories against Philip II of France. His younger brother John, who followed him as king, was not so lucky; he lost Normandy and many other French territories. In 1215, the barons led an armed rebellion and forced him to sign the Magna Carta, which put legal limits on the King's personal powers. The reign of Edward I (1272–1307) was rather successful. Edward strengthened the powers of his Government, and called the first English Parliament. He conquered Wales. His son, Edward II, lost the Battle of Bannockburn against Scotland. The Black Death, an epidemic that spread over all of Europe and parts of Asia, arrived in England in 1349 and killed perhaps up to a third of the population. Edward III gave land to powerful noble families, including many people with royal blood. Because land was like power in these days, some powerful men could now try to claim the Crown. The Wars of the Roses ended with the victory of Henry Tudor, who became king Henry VII of England, at the Battle of Bosworth Field in 1485, where the Yorkist king, Richard III was killed. His son, Henry VIII split with the Roman Catholic Church over a question of his divorce from Catherine of Aragon. Though his religious position was not entirely Protestant, this led to the Church of England breaking from the Roman Catholic Church. There followed a time of great religious and political troubles, and the English Reformation. Henry VIII had three children, all of whom would wear the Crown. The first to reign was Edward VI of England. Although he was intelligent, he was only a boy of ten when he took the throne in 1547. When Edward VI died of tuberculosis in 1553 Mary I took the throne when crowds cheered for her in London, which people at the time said was the largest show of affection for a Tudor monarch. Mary, a loyal Catholic who had been influenced greatly by the Catholic King of Spain and Holy Roman Emperor, Charles V, tried to get the country back to Catholicism. This led to 274 burnings of Protestants, and much hatred from her people. Mary lost Calais, the last English possession on the Continent, and became even more unpopular (except among Catholics) at the end of her reign. The reign of Elizabeth returned a sort of order to England in 1558. The religious question that had divided the country since Henry VIII was put to rest by the Elizabethan Religious Settlement, which set up the Church of England in much the same form it has today. The slave trade that made Britain a major economic power began with Elizabeth, who gave John Hawkins permission to start trading in 1562. 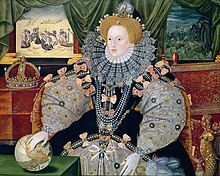 The government of Elizabeth was more peaceful, apart from the revolt of the northern earls in 1569, and she was able to lessen the power of the old nobility and expand the power of her government. One of the most famous events in English military history was in 1588 when the Spanish Armada lost against the English navy, commanded by Sir Francis Drake. Elizabeth's government did much to make her government stronger, and to make common law and administration more effective throughout England. In all, the Tudor period is seen as an important one, leading to many questions that would have to be answered in the next century during the English Civil War. These were questions of how much power the monarch and Parliament should have, and how much one should control the other. Elizabeth died without children who could take the throne after her. Her closest male Protestant relative was the king of Scotland, James VI, of the house of Stuart, so he became James I of England, the first king of the entire island of Great Britain, although he ruled England and Scotland as separate countries. The English Civil War began in 1642, mainly because of conflicts between James' son, Charles I, and Parliament. The defeat of the Royalist army by the New Model Army of Parliament at the Battle of Naseby in June 1645 destroyed most of the King's forces. The capture and trial of Charles led to his beheading in January 1649 at Whitehall Gate in London. A republic was declared, and Oliver Cromwell became the Lord Protector in 1653. After he died, his son Richard Cromwell followed him in the office, but soon quit. The monarchy was returned in 1660, after England had a time of anarchy, with King Charles II again in London. In 1665, London was hit with the plague, and then, in 1666, the capital was burned for 5 days by the Great Fire, destroying around 15,000 buildings. In 1689, the Dutch Protestant William of Orange, replaced the Catholic King James II in what is called the Glorious Revolution. However, in Scotland and Ireland, Catholics loyal to James II were not so happy, and a series of bloody revolts followed. These rebellions continued until the mid-18th century, when Charles Edward Stuart was defeated at the Battle of Culloden in 1746. The First Act of Union made Scotland, England and Wales into one country. The history of England after this 1707 Act is a part of Great Britain's history. Full text of The History of England From the Norman Conquest to the Death of John (1066–1216) from Project Gutenberg. New and Improved Timeline of England coming soon from BBC. This page was last changed on 22 February 2019, at 01:31.